One of the RAF’s most flamboyant fighter pilots, Paddy Barthropp joined 601 Sqn in August 1940 and flew Spitfires for the remainder of the Battle of Britain. By the beginning of 1941 he had shot down nine enemy aircraft. In 1941 Barthropp was posted to 91 Sqn as a flight commander, at Hornchurch. On May 17 he shot down an Fw190 but was immediately shot down himself by another Fw190 over St. Omer in Northern France, baled out and was taken prisoner. He escaped twice before being sent to the ‘persistent escapee’s’ prison Oglag XXIB in Poland. Within days he instigated a tunnel breakout. I joined the RAF in 1938 before I had reached my eighteenth birthday. My flying training took longer than usual because my instructor, Jackie Hicks, was a keen fox-hunter and when he wasn’t riding to hounds he followed them aloft from our tiger Moth. This was all very well, but when hounds were checked, and sent on a new line, he threw the aeroplane about so much to keep them in sight that I not only missed my instruction, but was sick in the back as well. In 1939 I joined 613 (City of Manchester) Squadron, Auxiliary Air Force. We had Lysanders and Hawker Hectors, and during the Dunkirk evacuation I flew my first operational sortie. Marcus Marsh, the famous racehorse trainer, was my air gunner and we carried two 120 pound anti-personnel bombs to attack enemy troops on the Dunkirk perimeter. We both felt that hurling these puny weapons was a complete waste of time, especially as we were shot at and hit by the Royal Navy on the way home. A few days afterwards we flew to Calais in a Lysander to drop supplies for the beleaguered British troops. We were fired at from the ground, and since Marcus had a number one gun stoppage, or something like that, he tore the gun from the mounting and threw it at the enemy troops below. On our return we found that our mission was in vain because our troops had surrendered the day before. 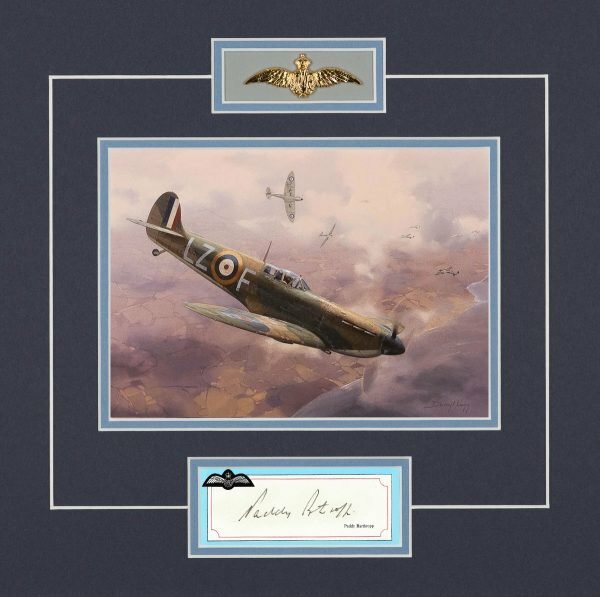 In August of that year I was posted to 602 (City of Glasgow) Squadron, RAF, and flew Spitfires for the remainder of the Battle of Britain. I had many gunfights, but only accounted for a Ju88 and shared in the destruction of a Heinkel HE 111 which crashed near Bognor Regis. After the fight we drove to the crash and afterwards I met the pilot in the local Police Station. He was wearing a smart pair of flying boots, which I persuaded him to change for my shoes, and I still have them to this day. In 1941 I joined 91 Squadron at Hawkinge – a very pleasant grass airfield on the south coast. With more experience my air gunnery improved and during that year, from memory, I destroyed nine enemy aircraft over France and Belgium. I thoroughly enjoyed my time at Hawkinge with 91 Squadron 91. It was commanded by Paddy Green and among its pilots were some colourful characters’ including Tony Lee Knight, Bob Holland, ‘Polly’ Perkin and Chris Le Roux. I flew 216 operational sorties with the Squadron and shot at 109’s, Dorniers, Heinkels, trains, boats, soldiers and anything else that moved that looked German! 100 octane petrol was free on the airfield so I had an extra twenty gallon tank fitted to my magnificent Lagonda, which I had previously purchased f for about £30. With it as part of the deal came a great number of four gallon petrol cans, which I had liberally dispersed around the airfield. 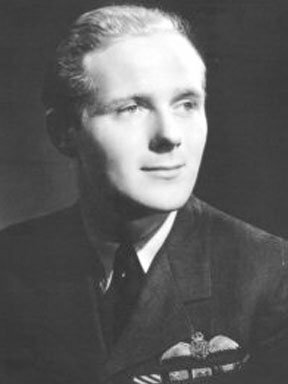 Later I was posted as a flight commander to 122 Squadron at Hornchurch and on 17th May, 1942, I destroyed an FW 190, but a second or two later was myself shot down by Karl Willius, flying an FW 190. Willius later told me he was extremely upset and angry because I had just killed his best friend, one Rolf Ermichen. I had baled out and been picked up by German soldiers who relieved me of my gold half-hunter watch and my silver cigarette case. That night Willius visited me in the jail at St. Omer and before he left asked me if I had any complaints or requests. I told him about the watch and cigarette case and he muttered something about “army bastards”, and a few hours later the watch, cigarette case, some black sausages and half a dozen pints of lager beer were delivered to my cell with a card that said ‘With the compliments of the Luftwaffe’. I escaped twice, but was captured on both occasions, and remained a prisoner of war until May, 1945. I left the Service in 1958 to begin a Rolls-Royce chauffeur driven business which, I am happy to say, is thriving today. I flew the Hawker Hector; Westland Lysander; Spitfire MkII; Spitfire 5 (B and C). After the war I attended No. 4 Course of the Empire Test Pilots School and flew all types of Spitfires up to the Mark 24. The aircraft was part of you and when frightened, either in testing or in combat, I think one used to talk to one’s Spitfire, and I am equally sure that it used to answer.